Graphene is a nanostructure for carbon atoms that arranges them into two-dimensional sheets in a regular hexagonal pattern. Due to its molecular, electrochemical and physical properties, it could have an essential role to play in the future of technology. Graphene has already been studied for its potential in energy storage, water filtration, and general nanotechnology applications. However, its use in the lab and in the industry has already run up against some serious issues. Researchers have realized that graphene can be difficult to transport and store. It is synthesized from common-or-garden graphite, which is oxidized to take the 2D form that is needed by scientists and engineers. This process is also known as graphite reduction or exfoliation and results in the product, graphene oxide (GO). It requires that the resulting GO is dispersed in rather large amounts of water. It is also often delivered in this form, i.e., the volume of a single consignment of graphene, in GO form, can be a hundred or a thousand times greater than the carbon-sheet content found in the container. GO can also be present in dry forms such as powders; however, these formulations are prone to combustion (as they would just be coal dust in different, energy-rich conformations). It could be frustrating to pay for something to arrive in a 500-liter bottle that could, in fact, be carried around in a 10-kilogram box! Therefore, science would benefit from a different, more stable form of GO that could be moved around in more concentrated forms. Luckily, this form does exist, in theory, at least. The chemistry of graphene dictates that it can conceivably be combined with water in such a way that it takes on the consistency and properties of dough. The GO dough is the ‘second last’ form of the molecule, next to absolutely solid GO. This more-malleable form may be more desirable, however, owing to its flexible nature and weighing less in transit. Engineers have been assessing processes to produce this visco-elastic state of GO for some time. Some groups have considered the possibility of adding plasticizers to GO in order to make this happen. The addition of such a substance is an excellent way of making inert, viscous and malleable doughs, as anyone who has played with plasticine knows well (and now, where the term originated!). Unfortunately, this solution comes with the drawback that the plastic will also have to be removed from the GO when researchers need purer nano-carbon to work with. This may involve the inclusion of potentially expensive or time-consuming steps to the GO production process – one that also runs the risk of losing increasingly valuable graphene over time. However, these concerns may now be moot points. 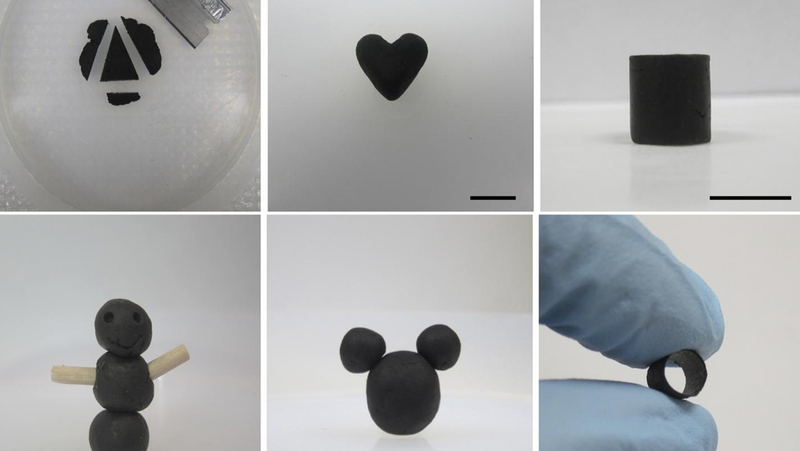 A group from Northwestern University and the National Sun Yat-sen University in Taiwan have reported the development of a process resulting in the synthesis of GO dough made from nothing more than graphite and water. Therefore, it appears that their resulting substance is indeed the missing link between the ‘gel’ and ‘solid’ states of GO. This form of graphene is also reported as associated with many other desirable properties. It does not stain surfaces or skin (as GO gel does), it can be kneaded, is highly concentrated, and can be converted into various other forms of graphene or GO. These conformations are also the ‘best’ forms of graphene (i.e., regular sheets of hexagonal carbon atoms without stacking or irregular cross-linking). On the other hand, the bonds between the carbon atoms can also be altered, which is a property required for many nano-carbon applications. The team, led by Jiaxing Huang, found that they could obtain their dough by taking GO in its common ‘paper’ form (i.e., GO of about 5 to 20 nanometers across and 1 nanometer in depth) and adding water until it formed a foam (the next step in the GO physical state ‘continuum’). This foam was then freeze-dried, then had more water added to it until it formed the dough in response to kneading. The team found that they could safely hold, roll and deform this dough. They also reported that its re-introduction to more water followed by stirring and sonication (which is done using conventional desktop lab equipment) could yield the more dilute GO, in which it is typically transported. After this, it could be further processed back into GO ‘papers’ of the same quality and the same usability as the precursor sheets. All in all, it appears that the Northwestern/Sun Yat-sen team has made a big breakthrough in the graphene industry. It has resulted in a form of GO that can be freely moved about, stored and even played with before using it to produce the nano-sheets that may be increasingly necessary for many industrial and academic institutions in the future. Therefore, GO dough may be coming to a lab near you soon!